Musicals don’t come much more low-key, wholesome or Canadian than ‘Come from Away’. Writers Irene Sankoff and David Hein cook up the straightforward world of the Newfoundland town of Gander using a very straightforward set of ingredients. The cast wear sensible shoes and lumberjack shirts. They tramp across a wood-decked stage that evokes the huge skies of their tiny island. They sing their way through a set of folk-tinged songs that tell stories of the five days after 9/11, when 38 planes made emergency landings on the island’s huge, disused airstrip. And it’s all totally, soul-feedingly wonderful. 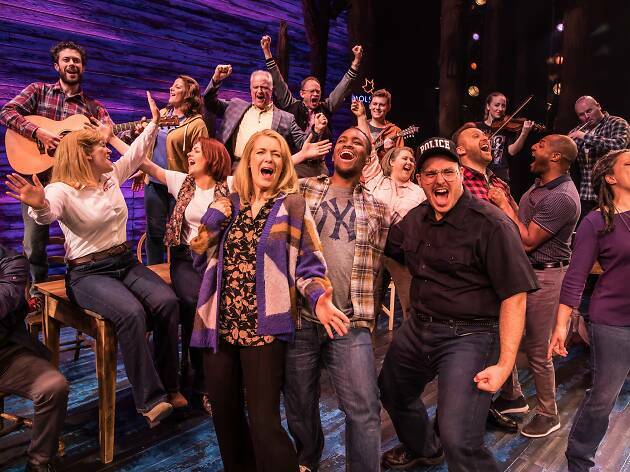 ‘Come from Away’ has been a massive sleeper hit across North America, Broadway included, and it’s easy to see why: it mixes down-home authenticity with the desperate intensity that comes in times of crisis. This is a moment where 7,000 temporary arrivals join a community of just 9,000 people. Logistics might not be the sexiest of topics for a musical, but one of the many surprising joys of this show is how gripping it makes things like the struggle to rustle up transport at a time when the local school bus drivers were on strike and had to be coaxed into crossing the picket line. Then there are beds, food, medication and interpreters to be sourced for passengers from across the world: one non-English-speaking couple communicates by cross-referencing Bible verses. Based closely on interviews with real Newfoundlanders, this is a picture of a community that stretches itself to breaking point to accommodate the stranded travellers. Like the local animal shelter worker who battles to rescue furry cargo from the planes’ holds, including cats, dogs and a pregnant bonobo ape. Or the schoolteacher who offers comfort to a New Yorker whose firefighter son is missing. It feels so organic that you almost don’t notice how carefully it’s been crafted. Individual stories are woven through rousing, foot-stomping, all-company choruses. Actors swap between playing locals and incomers with a fluidity that shows it’s just chance separating the two. It makes you look inwards to ask: what would I do in their place? The show’s message about the power of doing good is underscored by darker notes. Among the waves of queasy post-9/11 fear, a Muslim traveller is treated with suspicion along with kindness, and subjected to a humiliating strip search. Another young New Yorker feels so welcome on the island that it makes him mourn the community and safety he’s missing back home. ‘Come from Away’ creates a kind of temporary utopia: a little world where (almost) everyone is forced, by earth-shattering events hundreds of miles away, to come together and build a community based on principles of generosity and care. It’s seductive in its resolute unsexiness, and its gentle uncynical warmth spills off the stage, extending a hug to an audience that wouldn’t dream of turning it away. Not advisable for people who are sensitive. It is a very stressful show which is a pitty since they could have set the focus much more on the positive relations which developed through the incident and funny stories. Instead they focussed way too much on anxiety stress and the negative aspects making the audience feel stressed 90% of the show. In an era of burn out people don’t come to the theatre to get their stress levels increased even more(lol) however I am aware that this is completely subjective. Just want to emphasise that this is nothing for anyone who is sensitive to stress and easily annoyed. Also the American accents were a bit over the top which impacted the singing in a negative way. Honest feedback is valuable that’s why I give it and also to warn anyone who is sensitive or expecting a positive uplifting musical .. a pity cause I think the story has much more potential for being happy and funny. Anyways it’s completely subjective -the actors were good!! And the music was amazing! Phoenix theatre is anything but comfortable though which is shocking for these expensive prices. If you’re taller than 1.75cm it is a nightmare don’t do it there is no space for your legs - it is shocking that they do not warn about this since some people can’t even fit into the chairs and have to sit on the stairs when they are tall -and this is a setting which is not acceptable due to the high price of the tickets. Phoenix theatre should educate people about this before buying tickets and have solutions for people with long legs. One of the most heart-warming productions I've ever seen - you have to see this musical. Taking what sounds like a terrible premise for an uplifting show, Come From Away nods to, but rightfully strays away from sadness and hate to show the goodness in humans through a brilliantly executed energy-filled production that left me welling up with warmth. The music is beautiful, with a fantastic live band on stage who integrate into the show. I was worried I'd get lost with the changes in characters across actors, but it was clearly executed, so there was no confusion. I’ve wanted to see “Come From Away” since a chance encounter with the song “Me and the Sky” left me in floods of tears. It didn’t disappoint. Undoubtedly, it’s one of the most heartwarming and emotionally touching evenings I’ve ever spent in the theatre. It’s unusual and refreshing to see a show about such normal, everyday people (albeit in extraordinary circumstances), and individual stories and moments of humanity are expertly weaved throughout. The ensemble cast for the most part deal admirably with playing multiple roles, and show real emotional depth. Ideally, I’d give it 4.5 stars. If I’m being picky, I’m not sure how accurate the accents of the Newfoundlanders were, and on occasion it was difficult to understand. The style of the songs also got a tad repetitive, with some of the notes grating loudly on the ears. But these were a small blights on an otherwise epic show - one that i’d definitely consider re-watching. I only read a brief statement before seeing the play and was slightly wary how you could turn such a life changing event into a feel good show. I was definitely in for a surprise. The cast, the atmosphere, the storyline touched my heart and my emotions were on a rollercoaster. It’s nice to be reminded that there is kindness to be found, when a tragedy happens. I left the theatre with my faith in humans restored. I loved this musical! It was a lovely take on the side-stories surrounding the September 11 tragedy... and it really illustrated how kind people can be to eachother in times of hardship and need. The music was excellent and the cast were very good. I found myself laughing several times at what I thought was going to be a sad musical! And I left with a really warm, fuzzy feeling inside. Definitely recommend this one if you're looking for a heartwarming night out. When a show you've only heard of days before turns out to be one of the best you've seen in a very long time, you know it was a fantastic evening. Based on the real life events that befell a small town in Newfoundland when 7000 passengers were stranded there in the days following 9/11, it's one of the most joyous, uplifting evenings I've ever spent in the theatre. Fargo-esque accents and a cast who alternated between visitor and host meant it took me a little while to get into it but once I did? Pure magic. The cast are hugely empathetic with Rachel Tucker delivering a knock-out solo as air pilot Beverley Bass but she leads a wonderful ensemble team who show the power of love, friendship & trust over suspicion, fear & hatred. Making his West End debut as New York native Bob, Nathaneal Campbell was outstanding, absolutely my star of the evening with pitch-perfect comic timing that seamlessly relaxed & befriended the audience but there were so many characters whose stories were perfectly woven together. Heart-felt into hilarious into thought-provoking, each relationship was given just enough space to breathe and each one was peppered with truthful, relatable, believably poignant moments that left me wondering what I would do in this situation. The show also massively sells Canada as even more a beacon of hope, decency & openness than it has become in recent years. Visit the place? I left the theatre wanting to move there, kiss a fish & become an honorary member of the community! I'm not sure there are any key anthems that will be remembered months later and I can't see it running for decades like some of Theatreland's more senior members but it feels like everything you could hope to see in an evening out right now. These are people you want to spend time with and the just-short-of-2-hours running time felt like the perfect length without any pesky interval to pull you out of the experience. Honestly, if you don't leave the Phoenix wanting to be a better version of yourself and a better friend, neighbour & human being to those around you, you need to buy another ticket and then another and another until you do. You probably have not heard about Come from Away yet, so this is my chance to convince you to buy your tickets, or to ask for a belated Valentines’ day gift! Come from Away is set on the really sad day that was the 9/11, when the aerial space of the United States was shut down following the catastrophe we all know about. What we rarely know is that 38 planes landed in the small town of Gander in Canada and that 7000 passengers were welcomed, housed and fed by the residents. The musical follows the stories of some resident and characters during those few days of chaos where humanity and generosity helped people to go through this experience. Everything is to like in this musical! This is a MUST SEE musical! I didn’t have any expectations nor was I entirely sure of the storyline however I was hooked from the opening scenes. The simple set housing the folk band on stage allowed the audience to be swept up in the stories of the people from the small island of Newfoundland during the 5 days following the aftermath of 9/11. An incredible talented cast and enjoyable soundtrack added to this refreshing story of the true kindness of a small town community when 9/11 shocked the world. It’s a heart warming tale that reminds us that it doesn’t matter where we come from, what religion we believe in or what language we speak because kindness knows no barriers. When thirty-eight planes land at Gander, Newfoundland, because of nine/eleven with diversions over America, the locals need to organise themselves to cater for thousands. Two or three planes a day is their norm. Food, clothes, bedding and phones are all needed by these stranded passengers. The cast turn from being locals to passengers in the twist of a beat. The music is wonderful and the feelgood factor- huge. This musical has a big heart and it shows itself constantly. Go! you wont be disappointed. Covering an international event that effected every person uniquely is a very impressive undertaking for a hour and a half play, but Come from Away accomplishes just that. A hybrid of energetic folk music and theatrics brings a small town in Newfoundland to life as they welcome strangers from abroad into their lives. I was really impresssed with the casts ability to each play multiple characters, while keep them distinct and personal enough that from the first word they say you know the characters situation. I wasn’t sure what to expect but I was absolutely blown away by this show. The cast is so talented, the music is amazing and the set is simple but so clever. The story is fascinating and you really have to keep reminding yourself that it’s all based on fact. The most impressive thing for me was the perfectly-executed balance between the incredibly positive energy that the show is full of and the tragic truths that form part of a narrative that actually unfolded. There are some hilarious moments but also real poignancy and it’s really amazing how the cast are able to play so many different characters and do justice to every single one of them. A must-see! Coming from a family who were profoundly affected by the events of 9/11 I really wasn't sold by the sound of a riotous musical based on that day. For the record, I really needn't have been concerned. The show shines an energetic & heady light on the true story of the small population of Gander, Newfoundland banding together to transport, feed & ultimately provide a home for the thousand or so displaced travellers who were grounded there in the wake of 9/11. It starts with a bang and propels forward without stopping, sweeping through multiple true accounts from the individuals involved and maintaining pace despite there being no interval. The set moves seamlessly from plane to school to bar to home and back without us losing any sense of place. I had seen the words 'life-affirming' bandied around in online reviews and on social media and decided I really had to see for myself to believe it were possible; I'm utterly impressed that they pulled it off so effortlessly. When you hear a musical based on the events of 9/11, it's filled with heavy emotions. However when you are transported to the rock you are filled with high spirits and laughter from the people who came together at a time of crisis. Each cast member played multiple roles with a variety of characters and personality which they all master. Along with a skillful band which fills the room with upbeat music. When you go and see this show you will come out with a warm heart and the storys of a community that put others first. On a logistics front this show has no internal ( which just shows the stamina of the cast) which makes it easier to get late night trains. It doesn't feel right to gush about how amazing this musical is when the story is based on the most catastrophic terrorist attack. 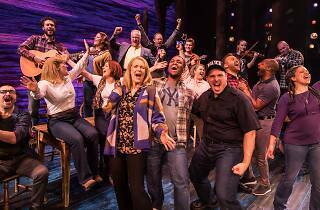 But Come From Away deserves its acclaim and 5* reviews. It shows, that in even the worst times, the kindness of humanity. The thoughtfulness in which the musical tells the story of so many people's lives and experiences is perfect. The songs are heart warming, emotional and funny. And in a musical where there isn't one main character the actors are all worth their salt. The 1 hour 40 run keeps the intensity going and ensures the story doesn't lose its momentum. It's an important story thay I'm glad has been made it to something so many people will enjoy and also learn from. Be prepared to be crying one minute then laughing the next and even crying while laughing! It stirs every emotion and is worth it. I didn't know much about this musical before going to see it, other than it was based around the events of 9/11. Although it was really more about a town who took in people from diverted planes and definitely told a story that I've never considered before. It was an uplifting story about the generosity of these people in a time of tragedy, however I did feel like I was missing something. Fair play to all of the actors on stage as they played different people and the energy didn't wane throughout, even without an interval. However, I found their accents were very confused and did blur into one so at times I struggled to determine which particular character they were playing. There were some great singing voices and some comical characters but I really felt that there wasn't much of a plot. It has to be said the rest of the audience pretty much, laughed throughout and really enjoyed it but it definitely wasn't one of my favourite musicals I've seen. This is a joyous piece of theatre, which makes you believe in the goodness of humankind. I didn't know much about the town of Gander in Newfoundland which took in planeloads of people after being diverted on September 11th. We don't get to really know any of the characters in depth but we do get a snapshot of the people of Gander and the goodness of their souls. The show manages to be funny and not too serious but also portrays the harsh realities of the situation these people were in. You will leave feeling educated, humbled and uplifted. To take an event, so tragic and shocking, that the world stood still, such as the 9/11 Twin Towers terrorist attacks and make it into a full blown musical comedy, is not an easy feat. Although this show is not really about 9/11, but more about one small story - or several stories - as you get to hear in the theatre - a couple of thousand miles away, where the kindness of strangers shows us that in the face of adversity, when hell is happening here on earth, somewhere, at the same time, something wonderful can also occur. I didn't think it was possible for my heart and soul to sway quite so intensely - wanting to sob out loud to then laughing so hard - within one same scene. From the moment the actors hit the stage and started singing, to the very very end, the show was full of energy, raw emotion and had the ability to make you feel anger and happiness all at once. An absolutely beautiful, sometimes sad, but mainly uplifting show, with the most incredibly clever production and script as well as wonderful talented actors and musicians. Entirely original and different from anything I've seen before. You MUST go see it. I know I want to see it again! If I could give it more than 5 stars I would. This musical was INCREDIBLE. Based on a true story, it tells the story of the town of Gander post the 9/11 attacks. It was an incredibly uplifting and heartfelt performance - tears and plenty of laughs!. Some amazing talent, the cast work so bloody hard! A must see, you won't be able to keep your eyes off the stage or your mind from wandering in this one! I absolutely love, love LOVED this musical! Come From Away is set around a group of people with very different lives thrown into the circumstance of their plane being grounded in Newfoundland, Canada after the terror attack on the Twin Towers hit. I have never experienced such a roller-coaster of emotions in 100 minutes. With a minimalistic set and cast, it is not your average hit musical but it does not lack anything considering. I laughed, I cried and I was hooked from the off. Would 100% go and see Come From Away again.